When Miriam first opened on 5th Avenue in 2005, their brunch was one of the best deals in the Slope. For a long time you could get your choice of brunch entree and coffee for $9.95 (when they first opened, I seem to remember it being maybe even $8.95 for a time--does anyone else remember this?). The prices have gone up and now brunch is $11.95. Not the super cheap deal, but still a decent price for the neighborhood. Lawman and I have worked our way through much of their menu. 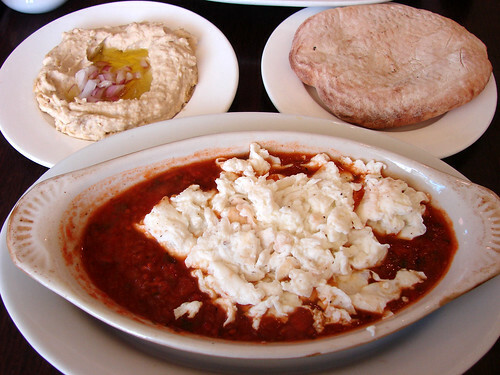 We love the Israeli breakfast--really anything that includes labneh, a cheese made from strained yogurt, is certifiably delicious. But Lawman's go to dish tends to be the Burekas in the photo above. 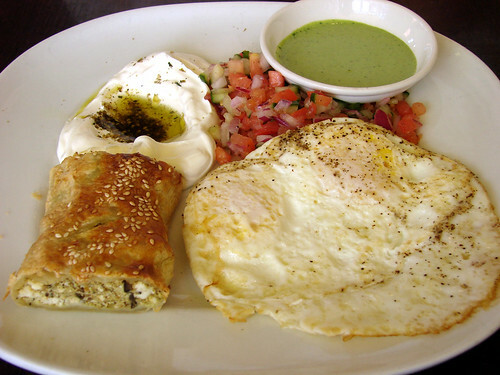 You get a little of everything--burekas, puffy pastry stuffed with stuffed with feta & olives, served with two eggs any style, labneh cheese(! ), Israeli salad & tahini sauce. Awesome. Simply awesome. I usually go for the Shakshuka and ask for egg whites instead of poached eggs. The tomato pepper sauce is tasty, but best of all it comes with a side of hummus and homemade pita. The pita is warm and fluffy and that hummus is terrific. Now I can make my own very good hummus at home, so I hold hummus to a very high standard. 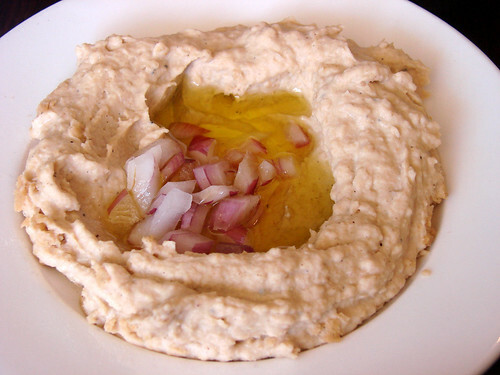 Miriam's hummus more than passes muster and it's drizzled with lovely olive oil and topped with onions. Yum. I must warn that the service at Miriam isn't quick and if you go at peak brunch times you might have to wait for a table. But they do serve brunch until 4:00pm, so if you are a sluggabed, this is the brunch spot for you. Yep, it was sad news. I live only a few blocks from the Cobble Hill location. Credit crunch is gonna do a lot of damage. One ray of light - the Park Slope location is right next to Gorilla Coffee, which I love. The Gorilla proximity is an excellent bonus. And if you are a late bruncher/have a sweet tooth, The Chocolate Room is very close as well. There is a Santa! Archway Cookies returns! Happy National Brownie Day, Brownie!! Take the F Train to Frosted Bliss! Care Packages! Get Your Care Packages!